This Salted Caramel Cheesecake is the best you’ll ever have! 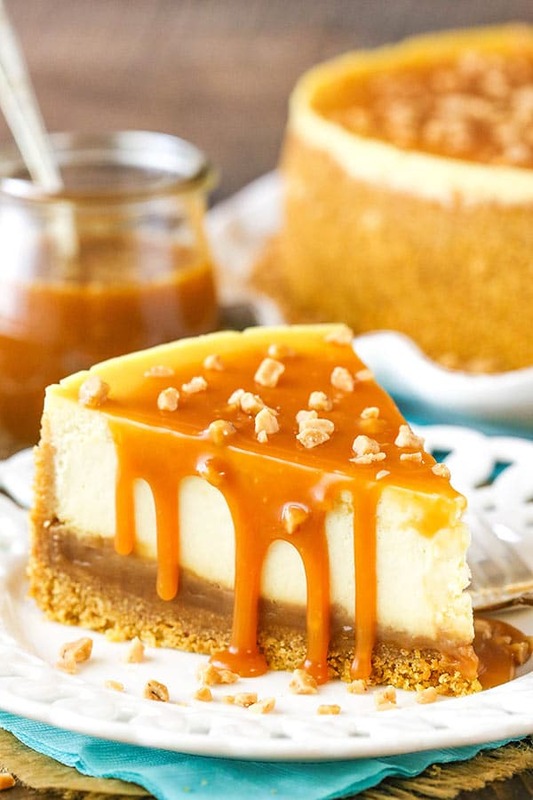 The caramel sauce is my favorite and it isn’t simply drizzled on top, but it’s actually layered inside the cheesecake as well! It’s smooth, creamy and delicious! 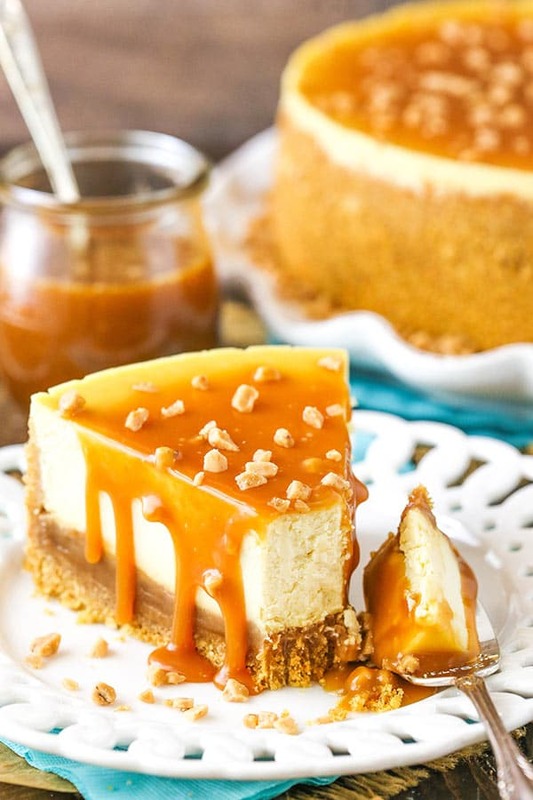 Caramel cheesecake perfection! This cheesecake is truly a combination of two of my very favorite things – caramel and cheesecake. And when it comes to caramel cheesecake, I didn’t want to settle. A simple cheesecake with some caramel drizzled on top just wasn’t enough. I want ALL the caramel in my caramel cheesecake. Sweet, salty, buttery caramel should be the main flavor, not simply the topping. So to make my dream of a wonderful caramel cheesecake come true, I started with my Homemade Caramel Sauce and thickened it up a bit. The first ingredient for the caramel is the sugar, which gets melted down. Once melted, butter is added, then heavy whipping cream. It makes the most amazing caramel sauce with such a smooth, buttery flavor. The final ingredient added is some flour. It’s not a typical ingredient for caramel sauce, but is added to part of the caramel sauce for when it’s baked within the cheesecake. Without the flour, it’d just disappear into the cheesecake as it bakes. 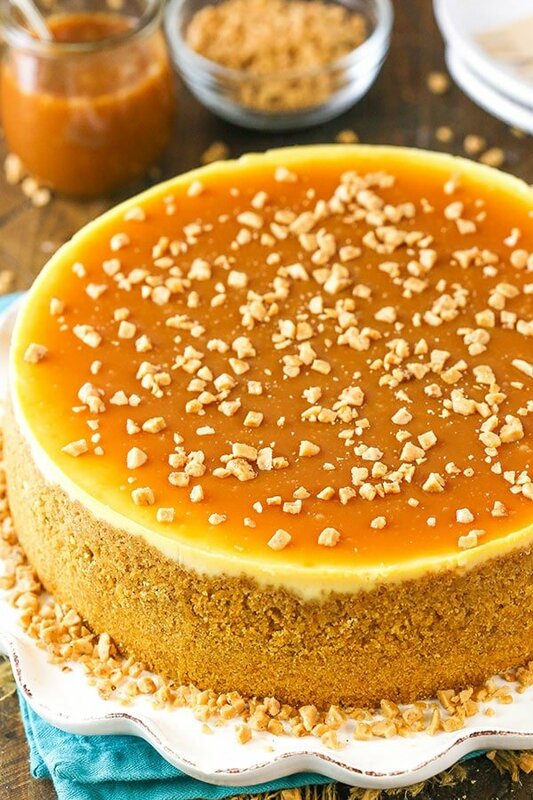 With the flour, it remains a delicious, thick layer of caramel within the cheesecake. So amazing! Once the caramel sauce is made and cooling, it’s time to make the crust. I used a classic graham cracker crust with a little bit of brown sugar for some extra flavor. When it comes to the cheesecake filling, we’re going to use brown sugar again. Combined with the usual cream cheese, sour cream, vanilla and eggs, you get a wonderful silky-smooth cheesecake filling. Just before you add the filling to the crust, you’ll add the caramel sauce. Bake the cheesecake in a water bath and then cool until firm. HOW DO YOU BAKE A CHEESECAKE IN A WATER BATH? Water baths can definitely be a pain, but with all the work that goes into a cheesecake it’d be a shame not to use one. Without it your cheesecake is likely to brown too much on the edges, fall in the middle and crack. Why do so much work and not have a beautiful result? If you need a little help with how to set up your water bath, check out my tutorial for a leak-proof water bath. There’s nothing worse than a water bath that leaks, so I use both a crock pot bag liner and aluminum foil to make sure that doesn’t happen. After the cheesecake has cooled and it’s time to serve it, add the remaining caramel sauce on top (with some set aside for drizzling on each piece) and sprinkle some toffee on top. The toffee adds a little extra flavor and texture. The final cheesecake is AMAZING! It’s so incredibly smooth and creamy! 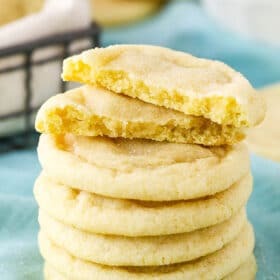 It’s buttery with hints of vanilla and a deep caramel flavor! It just melts in your mouth! And with all the caramel baked into the cheesecake in addition to the caramel on top – it’s pure caramel cheesecake heaven! I have no doubt you will love it! 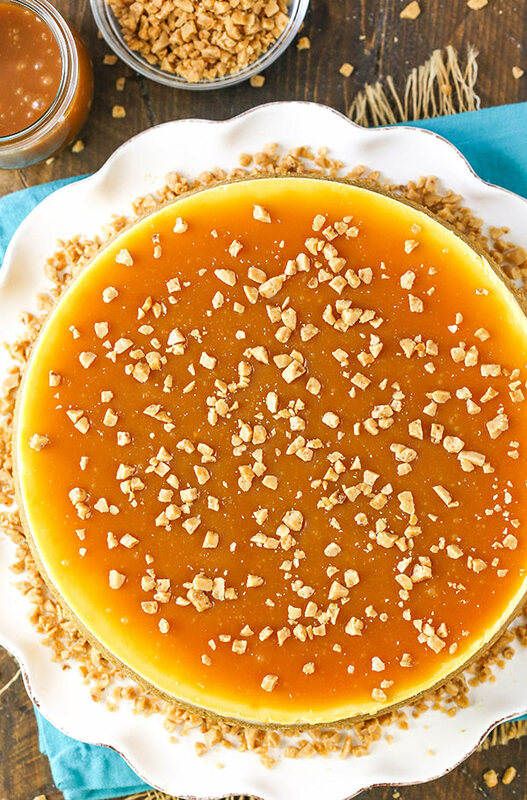 This Salted Caramel Cheesecake is the best you’ll ever have! 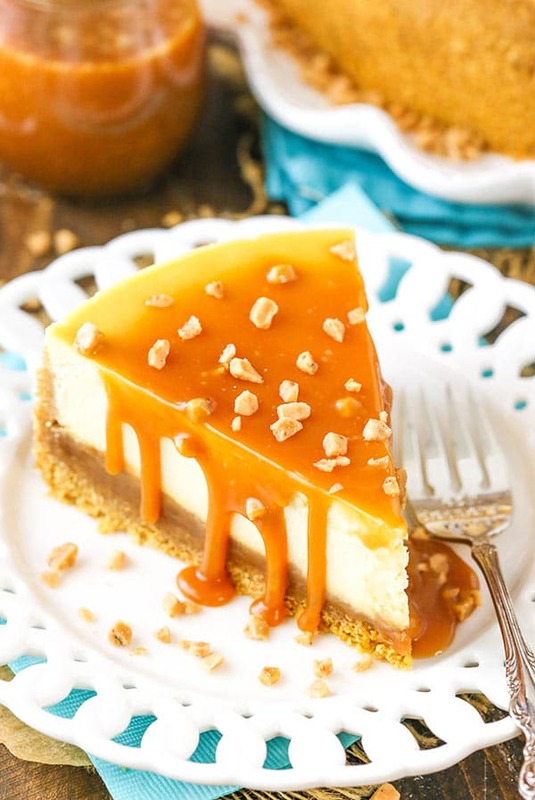 The caramel sauce is my favorite and you’ll find that it isn’t simply drizzled on top, but it’s actually layered inside the cheesecake as well! It’s smooth, creamy and delicious! 1. To make the caramel sauce, pour the sugar into an even layer in a large saucepan. 2. Heat on medium-high heat, whisking the sugar until melted. The sugar will clump up first, but will eventually completely melt. This should take about 10 minutes. 3. Once the sugar has melted, stop whisking and allow to cook until the sugar has turned to a little darker amber color. You may notice a nutty aroma. The change in color will happen quickly, so don’t let it go too long or get too dark or it’ll burn. Remove the caramel from the heat. 4. Add the butter and whisk until combined. The mixture will bubble up quite a bit, but keep whisking until all the butter has melted and combined. 5. Slowly pour the heavy cream into the caramel and whisk until incorporated. I find it can help to add just a bit at a time until the caramel starts to thin out, then you can add the rest. Whisk until well incorporated and smooth. 6. Set about 1 1/2 cups of caramel sauce aside for topping. Add the flour to the remaining caramel and set that aside. 7. To make the cheesecake crust, preheat oven to 325°F (163°C). Line a 9-inch (23cm) springform pan with parchment paper in the bottom and grease the sides. 8. Combine the crust ingredients in a small bowl. Press the mixture into the bottom and up the sides of the springform pan. 9. Bake the crust for 10 minutes, then set aside to cool. 10. Cover the outsides of the pan with aluminum foil so that water from the water bath cannot get in (see how I prepare my pan for a water bath). Set prepared pan aside. 11. Reduce oven temperature to 300°F (148°C). 12. Pour the caramel sauce with the flour into the bottom of the crust and spread into an even layer. 13. To make the cheesecake filling, beat the cream cheese, brown sugar and flour in a large mixer bowl on low speed until well combined and smooth. Be sure to use low speed to reduce the amount of air added to the batter, which can cause cracks. Scrape down the sides of the bowl. 14. Add the sour cream and vanilla extract and mix on low speed until well combined. 15. Add the eggs one at a time, mixing slowly to combine after each addition. Scrape down the sides of the bowl as needed to make sure everything is well combined. 16. Pour the cheesecake batter into the crust, over the caramel. 17. Place the springform pan inside another larger pan. Fill the outside pan with enough warm water to go about halfway up the sides of the springform pan. The water should not go above the top edge of the aluminum foil on the springform pan. 18. Bake for 1 hour 45 minutes. The center should be set, but still jiggly. 19. Turn off the oven and leave the door closed for 30 minutes. The cheesecake will continue to cook, but slowly begin to cool as well. 20. Crack the door of the oven for 30 minutes to allow the cheesecake to continue to cool slowly. This process helps prevent cracking. 21. Remove the cheesecake from the oven and remove the water bath and wrapping. 22. Refrigerate cheesecake until completely cool and firm, 5-6 hours. When the cheesecake is cool and firm, remove it from the springform pan and place on a serving dish. 23. 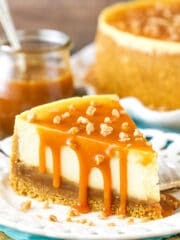 Prior to serving, pour 1/2 a cup of the remaining caramel sauce over the cheesecake and sprinkle with some toffee bits. 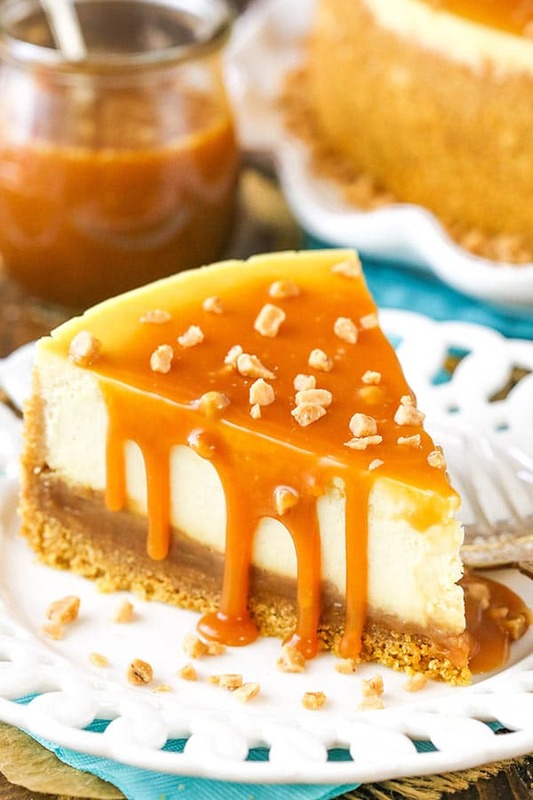 Serve cheesecake slices with the remaining cup of caramel sauce, for drizzling. 24. Store cheesecake in the fridge. Cheesecake is best for 3-4 days. 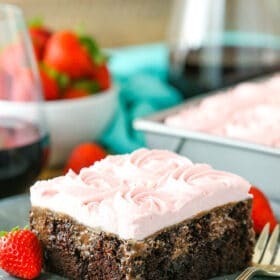 This is one of my favorite recipes ever! It’s delicious, moist, and the leftovers hold up well when just wrapped in plastic wrap and left on the counter. I’ve already made twice today for small party with friends! So happy they all love it and asked for the recipe :)I’ll definitely make it again. Mine came out great even though the power did go out while it was baking. It just got a little brown on the top. The crust with the caramel soaked in was my favorite part. I loved being able to say that I made my own caramel. In the filling, I added 1/2 a cup of heavy whipping cream. This was a great recipe for my first time making a cheesecake. This is a great recipe especially the trick with the water bath! Thanks a lot for sharing this. My friends are addicted to this cake. So glad it’s a hit! I made this cheesecake for my husbands birthday this week. After the first bite, he immediately closed his eyes and said “Mmm, this is the best cheesecake I have ever had”. It was also a hit with his co-workers the next day. Thanks for a great recipe! I’m so glad to hear that! Glad he enjoyed it! Thanks Mo! I am very excited to try this recipe. I have made several of your recipes and eveyone turn out exceptional. I am curious about the salted aspect of this recipe. I think I may add some salted carmel flakes on top. I hope you enjoy it! Glad to hear you’ve enjoyed the others!